the feeling that you are part of a remake of the Godfather is hard to avoid as ALL the men look like they are from Central Casting, Mafiosi section. I hate to say this but Sicily is the most honest part of Italy I have ever visited. It may be that the Mafia have decided to follow the tourist dollar but there is none of the annoying little lapses such as not returning your change or the extra items on your bill that are so annoying elsewhere. Speaking of the Mafia, there was no sign of them at all except for a wonderful stretch of modern motorway going, on stilts, from nowhere to nowhere and unconnected to the existing road network. At the same time, the feeling that you are part of a remake of the Godfather is hard to avoid as ALL the men look like they are from Central Casting, Mafiosi section. We arrived in Trapani thanks to Ryanair and were immediately struck by how un-European it looked. It looked and felt more like North African. The same dun coloured houses with windows shuttered and a closed look about them. Really a bit too third world. But things improve as you get closer to the city. There is not a lot to keep you in Trapani, which is a working port and services the Egidi Islands, which have become a big tourist venue. 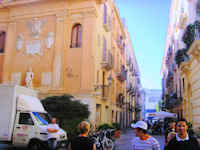 It has a nice historical centre with a few Palazzos and Churches but nothing too major. The public transport system works well and the train services connect you to the rest of the island so you can get out and explore. The joy of Sicily is that you have World History from 1,000 BC through Greece, Phoenicia Carthage Rome Norman and Hapsburg periods all mixed in together and, often, in the same place. And they have all left their remains, in some cases like the Punic Walls of Erice, in a very big way. This perfectly preserved village is just a long cable car journey from Trapani, perched right on top of the Monte Carnara with a view on a clear day from Italy in the North to Cap Bon in the south. It has been inhabited for at least 5 millennia and as well as having the aforementioned gigantic Cyclopedian Walls, which are worth the visit on their own, they have the original Grotto of the Goddess Venus. This goes back to when she was just a local fertility goddess. She did however have a particular cult with a line in beautiful sacred prostitutes which proved to be very popular with the passing sailors. This unique selling point, as well as the fact that the grotto was easily found (being on top of a very tall isolated mountain that could be seen from a long way out to sea), helped this local girl to make the move to the Big Time. After only a couple of thousand years of business, she was transferred to Rome. The rest is history. 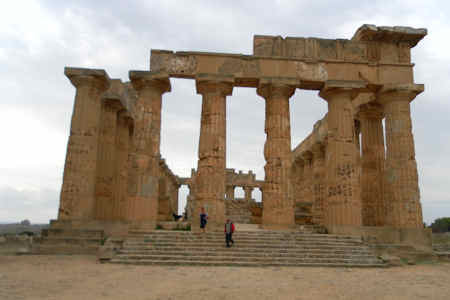 Sicily abounds in spectacular archaeological sites which are little known and less advertised. For example, the Park at Selinunte contains the remains of the largest temple ever built in Classical times (see above picture). Bet you didn’t know that. A Parthenon, bigger than the one in Athens, hardly gets a mention and a town (admittedly ruined) but on the scale of Knossos is also tucked away there. And to get to it you have to pass through Castelvetrano which is reputed to be the home of the capo di capi of… you know who. The most important thing in Sicily, though, is the food. The locals are interested in it and will talk about it for long periods before eating it for long periods and in huge quantities. The great collection of historical influences from Arab to Europe has produced a cuisine which is wonderfully subtle and yet satisfying. 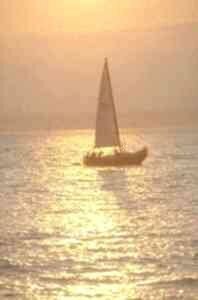 The sea is the great provider but the land also supplies its bounty. Pesto alla Trapanese is worth trying with the local version of pasta called Busiate. General verdict on Sicily is Well worth a visit. And a Return visit. And you can't say more then that. See also: Sicilia: Through the Eyes of a Child by Stewart Collins. See also the article: Sicilian Vespers by Nicky Gardner. A guide to Sicilian travel and all things Sicilian. Strong on maps. A site about Sicily and Sicilian people. Very detailed destination guides with good pictures. If you enjoyed reading the above article then you will probably also enjoy Haridwar by John Gregan, and Munich, also in Europe, and our latest articles covering the Orinoco Delta, La Mata, Marbella and Beijing.